I don’t know about you, but I’m loving this series so far! Do you ever feel like you don’t have time to slow down? Like if you took a second to think, you’ll be left behind? I came face to face with that in writing this week’s post. 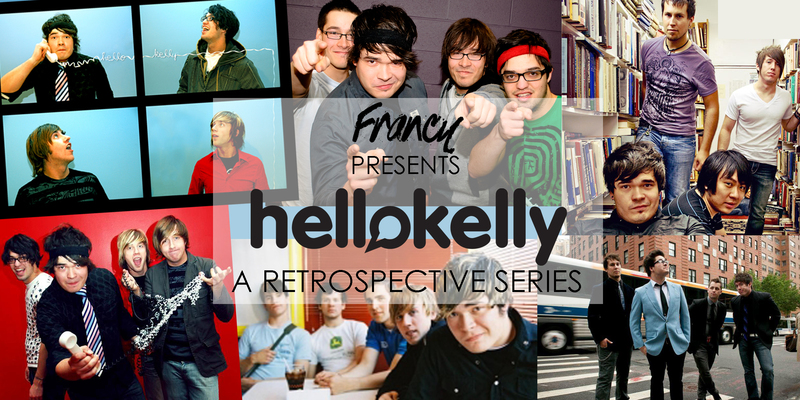 Last week, we walked through the first two years of Hello Kelly, which saw me launch the band with more success than expected and, frankly, take it for granted. I told you how ego crept in and how easily we lost track of the band’s vision because we just wanted “more.” More of what? Who knows! 2006 and I didn’t get along. It was a difficult year and there’s not much I can say to sugar coat it. In what felt like a mad dash to recover a sense of purpose after bailing on the Absolute tour, we found ourselves in Kansas for 2 weeks, playing a handful of regional shows. The tension had thinned, but it wasn’t gone. I remember very little being said on those country drives. When Adam Arkell, Kane Bender and Mike Donais all left the band within a month of each other, I was tempted to walk away as well. Hello Kelly’s success was nothing to shake a stick at, and it would’ve been understandable for me to move on to something else at that point. But James Watts, my good friend and bassist, still had faith in the band and that was heartening. I must also attribute the band continuing to my encouraging dad. His pep talks belong in movies. Around this time, two bands we used to play with often – One Way Out and Relentless – were both winding down. I did some recruiting and, in April 2006, James Watts, Phil Johnston, Lee Zavitz, Mat Lean and myself formed what came to be known as the 2nd official incarnation of Hello Kelly. I was dating a girl named Stephanie. Twice a week I made the drive (2 hours in the gas-guzzling van) to see her. My twenty year-old speeding habits earned me a tall stack of tickets and my insurance premiums learned to fly. Suffice it to say that money (and my major lack thereof) became problem #1 in 2006. I’m not proud that hard-earned band money filled my personal gas tank on a couple occasions. I don’t have many regrets, but not taking a business class early on is one of them. We were at Gospel Music Association Week in Nashville. Our manager, Chris Vacher, told us to meet with two suits from an independent label called 7Spin Music. These guys told us about how their boss wanted to sign a rock band. We were all happy to be in a band where big picture strategy was happening. Vacher wouldn’t let us play for free, and he started targeting bigger shows like conferences, camps & festivals. But we were still coming against every regional band’s nemesis: Over-saturation. The answer to this dilemma was, of course, the USA. Tons of people, tons of venues & a higher ceiling for success. The notion of signing a US record deal was exciting. Remember: Back in 2006, you still distributed your CDs to actual stores. If the poster and album art looked cool, there was a good chance you’d move some units. I must sound like Grandpa Simpson describing this model. Who’s Grandpa Simpson? I believe I’ve made my point. As Vacher sorted through the contracts, we found ourselves playing alongside Superchick in Ohio. They invited us onto their tour bus and we told them about the label offer. “You seem worn out & aimless, like you’re about to sign this deal out of fear,” is the heart of what I remember them telling me. They advised us to hibernate, write new material and rediscover our identity before signing anything. I didn’t know what to think. Watts and I met Vacher at a Wendy’s off the highway weeks later. He had with him a copy of the contract and a pen. This was the deciding moment. Johnston and Zavitz had moved on from Hello Kelly to start a new band. Hello Kelly hadn’t released new material in ages, and our crap van was on its last legs. All I could think about was all the money we didn’t have. The contract promised some modest signing advances, and I’d convinced myself that the band wouldn’t survive if we didn’t sign. Still, the advice from Superchick was ringing in my ears. Gearing Hello Kelly down for a minute to get some perspective sounded strangely freeing. Even if it would ultimately end the band, it would be a decision made in clarity and you can never feel bad about those. Watts signed first, because he knew the decision was ultimately mine since I wrote the songs. I remember telling them I wanted to take three days to fast and pray about the decision. Vacher asked, “What will fasting tell you that you don’t already know?” He wasn’t being sarcastic but I think I thought he was. Honestly, I don’t know what I was thinking – maybe I was just self-conscious – but pride took hold and I signed the paper. I’ll never forget the look on Watts’ face: He looked sad for me. I have a childhood memory of using a Game Genie to beat Super Mario Bros. 3. After I sent Bowser plummeting down that brick hole, the magical door to the Princess didn’t appear. It was a glitch in the game caused by the Game Genie. I did the work but got no satisfaction. Have you ever gotten exactly what you wanted and realized there was never really anything to get? Signing the deal with 7Spin was followed by that creepy “now what?” feeling. I realized that signing a record deal is usually followed by making a record. But my songwriting demos sucked and I had writer’s block. There was nothing new to say. But we did have a steady supply of shows. Some extremely talented friends stepped in as fill-ins while Hello Kelly searched for new official members. I got to play shows with drummer Brad Fisher and guitarist Jay Neilson. In early 2007, drummer Josh McCabe joined the band, forming the third official incarnation of Hello Kelly – James Watts, Mat Lean, Josh McCabe and myself. Guitarist Daniel Mutter was an honourary member, touring with us off and on in 2007 and 2008. He never appeared in photos, sadly. In the series finale of The Office, character Andy Bernard says: “I wish there was a way to know you’re in the good old days before you’ve actually left them.” Looking back on the time spent touring with this line-up, I realize that these were some of the best old days. Touring with these guys was easy & fun and it came across in our live show. The summer of 2007 saw us play Kingdom Bound – a festival I’d attended often as a teen. The set should’ve been rained out, but hundreds of kids rocked out with us in the pouring rain. It doesn’t get much better than that. … Where I slept on my suitcase and waited to fly to Nashville. My first week of professional co-writes was set up by the label, and I got to submit meal receipts. The best part of being signed was submitting meal receipts. So, the Christian music industry: I listened to CCM bands like Five Iron Frenzy, Relient K and Skillet in high school. My first band started playing worship music in our youth group before evolving to writing our own songs. Many of my contacts when I started Hello Kelly were youth pastors and churches, so it was easier to book with them. Part of my original vision for Hello Kelly was that I’d be free to write about my faith but always authentic about it. I didn’t like the distinction of being a “Christian band” because I’d seen bands let their fans down by acting “non-Christian” (subjective, much?) and that kind of pressure & expectation isn’t fair to anybody. I’ve come to believe that celebrity and faith don’t mix well. But that’s just me. I didn’t know how to articulate that in those writing rooms in 2007. The mandate was to write Christian songs and I had a Grammy-nominated writer tell me, “If you put ‘Jesus’ in this song, it’ll be a number one!” Real inspiring. Luckily, one of these writers had to cancel a session, so my rep scrambled to set me up with with someone else. Adam Smith had a NES hooked up to his TV, so I felt at home. We weren’t sure what to write, so I said: “How would you feel about a simple love song?” He thought it was a lyric idea, and we wrote “Simple Love Song.” We also wrote “Fall Over Me” that day, which is a faith-based song but actually came from place of authenticity. I emailed Vacher immediately after the session, telling him I’d found who I wanted to produce the new record. We played to a crowd of 8,000 that Fall. It was bittersweet to serve facemelts at Acquire the Fire in Hamilton though, because Mutter had recently announced that he was moving to Australia for school. This was the first time that the line-up was changing for a reason that wasn’t rooted in conflict, and I didn’t like the idea of touring without him. The show went by too fast, as they often do. Afterwards, we got to hang out with so many kids. It was awesome. After packing everything into the trailer, I handed the cash box and the bank deposit card to Watts. I’d learned how terrible I was with our finances, so I wanted to trust him with them instead. And then we all drove home separately. I was fifteen minutes from my hometown when I realized I needed fuel. Many gas stations in Ontario don’t require you to pre-pay, so I pulled up and put $10 of gas in the van. I immediately realized the irony in sending Watts home with the cash box when I tried to pay for my gas. Every card I had was either maxed out or tapped, and I had no cash. Broke. Cut to me, emptying the van and removing every floorboard, gathering every coffee soaked nickel and gunk-covered dime I could find. After 30 minutes, I’d found $9.46 and the attendant let me go, head hanging in shame. We recorded in Valparaiso, Indiana. Adam Smith hauled half of his studio up from Nashville, and we were joined by guitarists Taylor Burns and Travis Wilbourn. Several local studio drummers helped us out, but Hello Kelly drummer McCabe and synth player Lean did make the trip to play on a few tracks. Sadly, Watts, who’d been with the band since the beginning, didn’t get to play at all. Again, I don’t have many regrets but not fighting harder for James to be in that studio is on the list. 2007 drew to a close with Ontario covered in Christmas snow. I found myself reflecting on the coming year: We’d release our first full length, embark on our longest tour ever, and promote to US Christian radio for the first time. Hello Kelly was now aiming squarely for the Contemporary Christian Music crowd. For the next few years, interviewers would compare us only to Christian pop bands, only some of which were good pop bands. These moves all led me to where I am today, so I don’t regret any of it. Still, you never think money alone will motivate such a big trajectory decision. It sneaks up on you, and it can be hard to see that in your rear view. There’s nothing wrong with dreaming, being ambitious and working hard – but we aren’t robots! Despite what the world would have us believe, we’re allowed to back up and look at how we’ve programmed ourselves. Do we like it? Do we wanna change it? The answer doesn’t matter. The point is that we take a minute, be a human, and think for a second. Heck, maybe we even have a conversation about it with somebody else! Novel idea, I know! I hope you’ve been enjoying this series. If you are, would you tell somebody about it? Not necessarily on social media, though. If you want, you could literally just tell a friend to check it out. That would mean a lot to me! The next few posts are really fun and I can’t wait to share the rest of this story with you guys. Don’t forget to sign up below so you don’t miss anything! Please leave a comment or email me if this stuff is connecting. Thanks for reading. Here’s to being a human today and every day! Special News & New Video!